We can’t stop borrowing – Finance Minister – Royal Times of Nigeria. 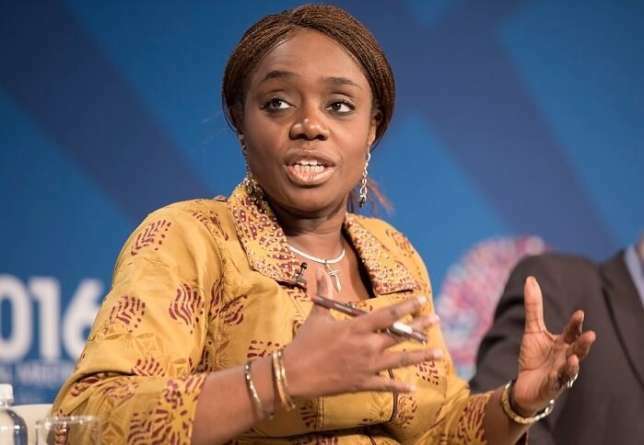 Minister of Finance, Kemi Adeosun said the two options before the country is to either cut public services massively or borrow in the short-term until it begins to generate sufficient revenues. Kemi Adeosun has said Federal Government will not stop borrowing money from international creditors in order to prevent massive job losses. Adeosun said with the country’s revenue dropping by nearly 85 percent, the only option is to borrow. She stated this in Washington D.C on Sunday, October 15, at a joint press conference with the Governor of the Central Bank of Nigeria (CBN), Godwin Emefiele. The briefing was held at the conclusion of the 2017 International Monetary Fund (IMF)/World Bank Group Annual Meetings. The Finance minister said the two options before the country was to either cut public services massively, which would have led to massive job losses, or borrow in the short-term until it begins to generate sufficient revenues. “We felt that laying-off thousands of persons was not the best way to stimulate growth. Also, when we came into office, about 27 states could not pay salary. If we had allowed that situation to persist, we would have been in depression by now. So, we took the view as a government that the best thing to do was to stimulate growth and spend our way out of trouble, get the state governments to pay salaries, making sure that the federal government pays and invests in capital infrastructure,” Adeosun said. Buttressing the minister’s points, Emefiele said the apex bank is trying to encourage Nigerians in Diaspora to keep remitting funds home, and also invest in the country. He said Nigerians in Diaspora remit $21 billion annually to the local economy. “We will put in place policies that will continue to encourage them. We are working on how we can actually link credit bureau arrangement to the foreign borrowing arrangement so that once there is a link between Nigeria and the foreign credit system, it will be easy for them to even borrow from Nigeria,” he assured. According to Adeosun, once growth is restored, the country would begin to systematically reduce its dependence on borrowing. She added, “Now, we are talking about tax and what we are saying is that people should be aware of their responsibilities to their nation. The solution to borrowing in Nigeria is that we must pay taxes. If you pay the taxes properly, there is no need to borrow. Of course, there is the responsibility on the part of the government to be more responsible and efficient. We are really focusing on this. We are trying to find ways to cut cost. Fundamentally, we must invest. We don’t have the power we need, we don’t have the roads yet and there is a lot of money required to fund these projects”. The minister further said that reducing Nigeria’s tax to Gross Domestic Product (GDP) ration from six percent to 10 percent will significantly reduce the amount the country needs to borrow and that will have a wider effect on the economy and bring down the interest rate. “So, many people are talking about how many loans we are approving; they don’t talk about how many loans we are turning down. Many do not go through and we are constantly monitoring state governments to ensure that the debts that they take on are sustainable. The problem with some of the states that have debt problems are legacy loans that were there before they came in. But since we came in, we have been very strict, trying to make sure states do not borrow more than they can service,” Adeosun said. She pointed that Nigeria’s debt to GDP ratio is one of the lowest. “We are at 19 percent, but most advanced countries have over 100 percent. I am not saying we need to move to 100 percent, but I am saying we need to tolerate a little more debt in the short-term to deliver the rail, the roads and power so as to generate economic activities, jobs, revenue, which would be used to pay back the debts. But I assure you that this government is very prudent around debt. We don’t borrow recklessly and we have no intention of bequeathing unserviceable debts on Nigerians,” she assured. Adeosun said revenues are needed to provide public services and the burden of taxation must be borne by those whose income allows them to bear it. She urged Nigerians to have a change of mindset on taxation in order move the country forward.